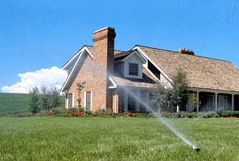 Our Sprinkler Systems provide you with optimal coverage for your yard and garden. We over-engineer our sprinkler heads because we want the best for you. TradeWind inground sprinkler systems are always designed for optimal coverage. No two designs are alike because no two properties are alike. With TradeWind Irrigation, your installation will be a custom installation, suited specifically for your lawn and garden's needs. TradeWind Controllers are the best controllers in the industry. They are very flexible and user-friendly and allow for programming of each individual watering zone. They also have a battery back-up, which keeps their memory in case of a power outage. TradeWind uses pressure regulating electronic control valves that monitor the pressure and flow of water traveling to each individual zone. 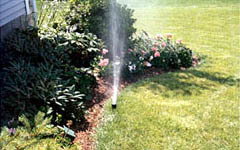 TradeWind Irrigation uses a sprinkler head that nobody else in the industry uses. Our sprinkler heads are made by Hunter Engineering and built to our exacting specifications. Our heads are more expensive to us than those of our competitors, but we want only the best for you. Our systems feature sprinkler heads with a stronger spring than other sprinkler head designs. When sprinkling stops, these springs will pull the head down against the check valve with more force. This makes our sprinkler heads self-cleaning, which means they will be less prone to service problems and your service bill will be lower. Our goal is a perfect system, every installation we do. TradeWind heat shrinks all connections and we use double stainless steel clamps at all connections to ensure a water-tight seal. We guarantee no leaks. TradeWind's installation technicians are professionally trained and are skilled in all phases of irrigation. This professional and knowledgeable experience costs us more, and due to their skills, hard work ethic, and strategic installation techniques, you get a higher quality installation. None of our employees are allowed to do a call on their own unless they have served with us for a full apprenticeship and meets our exacting standards. The newest unsupervised technician you will see on your job has been with us for four years. TradeWind installations are very neat. When the installation is complete, your home's interior and exterior are left spotless. We pride ourselves on quality, which encompasses top-notch workmanship and materials, a clean work environment, and the best service in the industry. *Generally, an irrigation system will have 30 gallons of water in the pipes for every 20 heads. Since the average installation has 25 to 30 heads, that is 40 to 50 gallons of water that will be wasted without our check valve systems. In Connecticut, we usually experience 140 watering days yearly, which adds up to 3,000 to 5,000 gallons of water you will save yearly with our systems.